In the previous section, we learned that Christ’s return for his people will be associated with the sounding of the last trumpet (see In the Twinkling of an Eye). To categorize a trumpet sounding as the last one, there must have been other trumpets that come before it. Of all the prophecies concerning the end times within the Bible, only in one place is there found a series of trumpets that are predicted to sound at the end of the age. 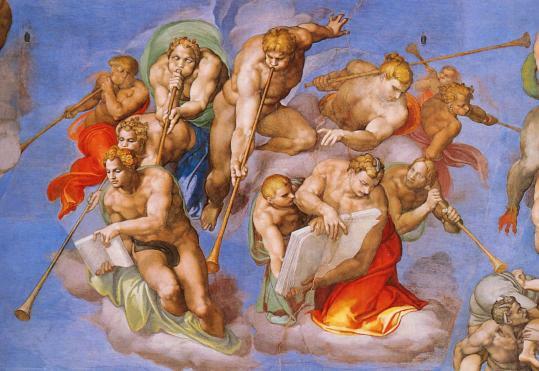 In the book of Revelation, within chapters 8-11, there are a number of descriptive prophecies given concerning the aftereffects resulting from the sounding of seven consecutive trumpets blown by seven angels initially seen standing before the God of Heaven. When each trumpet sounds, it can be seen to herald a variety of horrific events during the final years leading up to the end of the age. The trumpet sounds are meant to punctuate the Great Tribulation period with ever more disastrous effects. Most of these trumpets and their effects have already been discussed in the section on World War III, because they reflect the worldwide consequences of a massive global war fought between the main military powers at the end. 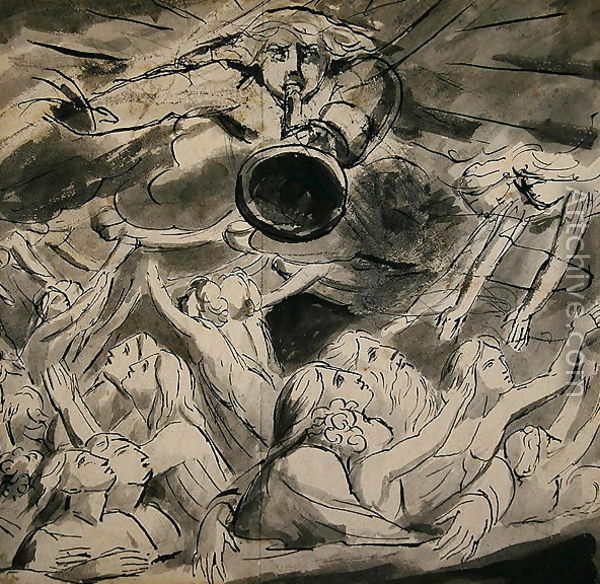 In those sections, the first six trumpets were found to have prophetic reference to the terrible effects of nuclear warfare—complete with an accompanying fiery holocaust that will destroy much of the works of mankind. These chapters in Revelation along with the associated seven trumpets, describe essentially in chronological order, precisely what will happen during the destructive final 3-1/2 years before Christ returns. “We give thee thanks, O Lord God Almighty, who art, and wast, and art to come, because thou hast taken to thee thy great power, and hast reigned. The Seventh Trumpet, therefore, instead of simply signaling more destruction like the six trumpets that came before it, is said to herald the very coming of Christ’s Kingdom. Even if this fact was the only event mentioned concerning its sounding, it would still nonetheless be a significant connection to what will happen at the time of the rapture. However, the elders also go on to say that this particular trumpet will inaugurate the judgment of the dead and the handing out of rewards for the servants of Christ. It is obvious that the only way the dead could be judged is if what happens also includes a resurrection—particularly the resurrection of believers, because the final blessings of the Lord will not come upon his followers until they’re actually raised from the dead. This prophecy also says that the last trumpet will be the time that the Lord will “destroy them who destroy the earth”. This prophecy could only be speaking of the Second Coming, because that is the only point at which Christ will return and stop the spiral of destruction that will threaten all life on earth at the end. Therefore, the Seventh Trumpet is seen to include not only the resurrection of the followers of Christ, but also the rewards given to the believers as well as the actual event of the Second Coming. Thus, this prophecy agrees perfectly with Paul’s other statements concerning the rapture and the Return of Christ (see previous sections). The last trumpet, which the Apostle said would be the point of the resurrection, is also the Seventh Trumpet and final one mentioned in the book of Revelation. And both of these prophecies exactly correlate with Christ’s prediction that the rapture will occur immediately after (or at the end of) the Tribulation period (Matt. 24:29-31). When the trumpet sounds, the great transition from the kingdom of man to the Kingdom of God will take place. 9) The resurrection of believers will result in immortal and incorruptible bodies which will be angelic and glorious in their appearance. 10) The process of the resurrection will occur “in the twinkling of an eye” or virtually instantaneously. 11) There will be a group of living believers who will never have to experience death but will be transformed into immortal bodies at the same time that the dead are raised. 12) The resurrection (and therefore the rapture) will occur at the sounding of the last trumpet. 13) The last trumpet corresponds to the 7th trumpet described in the book of Revelation and will occur at the moment of the Second Coming (i.e., at the end of the Tribulation).